Trans-Resveratrol is found here and available to you at its peak of potency. Other Ingredients: Dicalcium Phosphate, Vegetable Cellulose (capsule shell), Magnesium Stearate, Silica. Resveratrol 500 mg is rated 5.0 out of 5 by 3. Rated 5 out of 5 by Kalman from Is worth to recommend. I have to buy this brand of resveratrol in two times, the last time is friend help me buy on sb's behalf.This product is a natural antioxidant, and content is very high, after taking really the very body has very big effect, is worth to recommend. Rated 5 out of 5 by Cheryl from Excellant Very happy with customer services and products. Rated 5 out of 5 by Baba from Best ingredients and brand name. 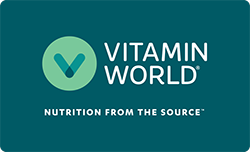 Best price when discount is offered I've compared this product with other companies and have foung Vitamin World to provide the best price when discounted.